Five Incircles in a Square: What Is This About? Here we have a very characteristic sangaku - a Temple geometry - problem. Most of geometric sangaku dealt with several circles inscribed in other circles or other shapes. In addition, most often a sangaku was a computational problem as opposed to problems that require a proof. The problem below is a little of both: a proof of the result is supported by a chain of calculations. In the manner of proof #3 of the Pythagorean theorem, four equal right triangles and a small square are combined into a larger square. 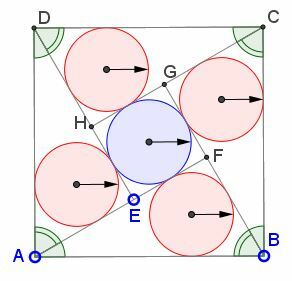 Circles are inscribed into the four triangles and the inner square. A question: What can be said of the configuration where all five circles have equal radii? r = (a + b - c)/2. r = (a - b)/2. which means that the angle opposite b is 30° and the other one is 60°. From here we easily find the common inradius: r = c·(√3 - 1)/4. Most of the sangaku problems are much more difficult.